In July of 1963, a group of African American protesters were arrested during a series of non-violent, anti-segregation demonstrations in Americus, Georgia. More than a dozen girls, some as young as 12, were taken to the county jail before being transferred almost 30 miles away to the Lee County Stockade — a small cement building being used as a makeshift jail. And although the girls were never formally charged with a crime, they’d stay there for nearly two months without their parents’ knowledge. One guard watched over them in this run-down structure with barred windows, a broken toilet, and very little food. 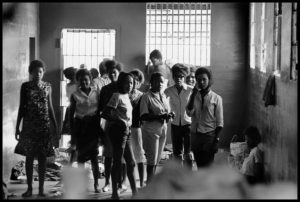 The girls were released after nearly two months when Student Nonviolent Coordinating Committee (SNCC) discovered their location and sent a photographer, who published photos of the living conditions at the stockade. More than fifty years later, a few of the Leesburg girls, now women in their sixties, sat down for StoryCorps to shine a light on this overlooked moment in civil rights history. Also Verna Hollis, who was pregnant while imprisoned at the stockade, sat down for StoryCorps with her now-adult son, Joseph Jones III. Top photo: (From left) Emmarene Kaigler-Streeter (who also recorded an interview with StoryCorps), Carol Barner-Seay, Shirley Green-Reese and Diane Bowens in 2016 outside the stockade building in Leesburg, Georgia where they were jailed as teenagers. By Alletta Cooper for StoryCorps. Middle photo: Young women are held in the Leesburg Stockade after being arrested for demonstrating in Americus, GA. They have no beds or sanitary facilities. From left to right: Melinda Jones Williams (13), Laura Ruff Saunders (13), Mattie Crittenden Reese, Pearl Brown, Carol Barner Seay (12), Annie Ragin Laster (14), Willie Smith Davis (15), Shirley Green (age 14, later Dr. Shirley Green-Reese), and Billie Jo Thornton Allen (13). Seated: Verna Hollis (15). Photo by Danny Lyon for Magnum Photos. 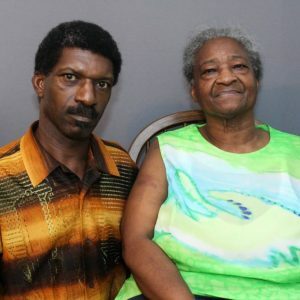 Bottom photo: Joseph Jones III with his mother, Verna Hollis, in Americus, Georgia after their StoryCorps recording in 2016. Verna Hollis died the following year. By Alletta Cooper for StoryCorps. Originally aired January 18, 2019, on NPR’s Morning Edition. CBS: The place was worse than filthy. SGR: Being in a place like that, I didn’t feel like we was human. SGR: Our parents didn’t even know where we were and I had never been away from home. After a week, it started messing with me mentally — as if no one cared — and I gave up hope many days. SGR: It was a lot of crying in that place. DB: I was scared Verna was going to die. If she ate, it would just come right back up. CBS: If she complained to anybody, it was under her breath to God, but we never heard it. SR: She wasn’t aware that she was pregnant. We didn’t know because we were children. VH: My name is Verna Hollis. JJ: My name is Joseph Jones III and I’m the son. I couldn’t believe that living in this town I had never heard this story. I didn’t know you were locked up. How did you feel when you first arrived there? VH: I was scared and mad that you could treat a human being like they treated us. We both could have died in there. JJ: You have been my inspiration as far as how to be strong. I’m proud of that and I try to live from that. SGR: When we got out of that stockade, my classmates and my teachers never asked me where I was coming from. I felt like I didn’t fit in, so, after high school, I left the area and moved forward. So what I did? I got a job in the library. And, for the first time in my life, I saw this picture. I said, This is us. But I wasn’t going to share that with nobody because I didn’t want them to know I was in that jail. SGR: …never in 52 years. DB: Today, when I got in this elevator, I was about to have a heart attack. I just don’t want to be closed in and I don’t want to be in the dark. I’m sixty-six years old and I sleep with two lights on in my bedroom.